By Kori ~ June 3rd, 2009. Last Friday evening was a gorgeous, sunny summer evening here in Seattle. It was the perfect night to gather with friends to enjoy a fabulous meal and good wines for one of our monthly wine tasting dinners. In February of this year, Mom (LaGayle) and Dad (John) spent three weeks in South Africa visiting the winelands. They had a great trip and discovered a number of good South African wines. As always when we travel internationally, their goal was to find good wines that are available in the United States so that we can continue to enjoy them once we have returned home. 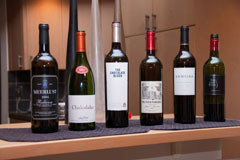 The six wines in this tasting dinner were wines that Dad selected based on their adventures in the South African winelands. While everyone enjoyed all of the wines and we would recommend them all, the top three clearly stood at the head of the pack. The 2004 Meerlust Rubicon, 2007 Spice Route Chakalaka, and the 2007 Boekenhoutskloof The Chocolate Block are excellent wines and paired wonderfully with Momâ€™s dinner of tomato basil soup, mixed green salad, grilled filet mignon, thyme roasted purple Peruvian potatoes, seasoned green beans with yellow peppers, and a delicious chocolate cake topped with raspberries, shaved chocolate, and whipped cream. Interestingly, the two wines that came out on top in the group consensus rankings were from the two wineries in South Africa where Dad did video interviews: Winemaker Chris Williams of Meerlust and Charles Back, owner of Fairview, Spice Route, and Goats do Roam. 2004 Meerlust Rubicon (Stellenbosch, South Africa): 63% Cabernet Sauvignon, 27% Merlot, 10% Cab Franc. Ruby red with medium depth. Lighter in color than the others. Very aromatic. Jalapeno and red fruits comes through on the nose. Bell peppers and cherry dominate the palate. Medium to full-bodied and smooth with medium tannins. Well-balanced with a long finish. Fantastic with steak. 2007 Spice Route Chakalaka (Swartland, South Africa): 57% Shiraz, 20% Grenache, 17% Mourvedre, 6% Carignan. Ruby red with aromas of smoke, cedar, and vanilla. Plums come through on the palate. Medium-bodied, medium tannins, and a long, crisp finish. Slightly bitter but softens with food. 2007 Boekenhoutskloof The Chocolate Block (Western Cape, South Africa): 55% Syrah, 20% Grenache, 16% Cabernet Sauvignon, 5% Cinsault, 4% Viognier. A lot going on in this wine. Aromas of olive, black fruits, burnt toast, and capers. Flavors of black fruits, particularly blackberry, and as the name suggest, chocolate. Medium to full-bodied, medium tannins, and a long finish. Well-balanced. Absolutely explodes with food. 2005 Rustenberg John X Merriman (Simonsberg-Stellenbosch, South Africa): 54% Merlot, 32% Cabernet Sauvignon, 6% Petit Verdot, 4% Cabernet Franc, 3% Malbec, 1% Shiraz. Rudy red in color. Nose is a bit tight up front. Opens up the longer it is open. Black fruits and coffee come through on the palate. Medium-bodied and the tannins become more drying with food. 2006 ANWILKA (Stellenbosch, South Africa): 66% Cabernet Sauvignon, 29% Shiraz, 5% Merlot. Nutty aromas with hints of detergent. Tastes better than it smells with red fruit flavors. Medium-bodied, medium tannins, and a medium finish. 2007 Neil Ellis The Left Bank (Western Cape, South Africa): 57% Cabernet Sauvignon, 33% Shiraz, 10% Merlot. Raspberry and dark chocolate come through on the nose, pepper and smoked meats on the palate. Medium to full-bodied, medium tannins, and a long finish. I have been a fan of Rustenberg for the past couple of years. The Rustenberg John X Merriman has become a staple in my house. Love it paired with seared tuna or steak. Thanks for sharing, Alex. I appreciate the tuna pairing suggestion. Sounds great. Thanks for a great article!! And thanks too to Alex for liking our red, the Rustenberg Stellenbosch John X Merriman!! It is so good to know we get this kind of attention in the USA and we really appreciate it very much, considering you have so much choice in that huge country of yours. Thanks, David. Mom and Dad had a wonderful time in the South African winelands, and I hope I have the chance to visit someday. Keep up the good work! 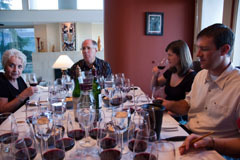 I was also turned on to the John X Merriman at a South African wine dinner! I quoted your review over at my blog, where I posted my own review of it today. Great wine that needs to be allowed to open up for awhile. Thanks for the mention on your blog. Always good to hear what others think of wines we’ve had. I agree that the John X benefits from some air. Cheers!